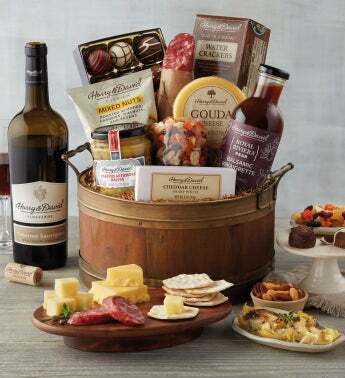 Savory gourmet favorites are packed in an elegant wine barrel-inspired basket that is sure to add a bit of rustic flair to any décor. Inside you'll find premium mixed nuts, sharp white cheddar and gouda cheeses, salami con vino, sea salt olive oil crackers, Royal Riviera™ balsamic vinaigrette, chocolate truffles, and more. Perfect for pairing with the bottle of 2015 Cabernet Sauvignon. Cheers!